The following meditation instruction is an excerpt from "The Awakening Time". Diana is channeling an entity, who is giving instruction in meditation. It is referred to as "extending one's inner light to permeate body and aura." "Is there something you could suggest that would assist a beginner in meditating?" Derek continued with his questions. "Yes. Something you yourselves have learned and taught many times, and that is extending one's own inner light, to begin. It is very beneficial to start by consciously focusing upon the inner light that is seated at the very center of one's being, then, mentally and consciously, expand it outwards into the aura. "This may be done quite simply by visualizing or imagining a small spark of light in the area between the heart and solar plexus. Mentally, see, feel, and sense that spark; know it is there -- pretend if necessary. Concentrate on that inner light. It is the very essence of one's being. You see, this spark of light is the real you. It is that creative spark of God-energy you bring with you into each incarnation and which remains within the physical until the transition you term 'death.' Now, imagine that spark of light becoming stronger, growing larger, expanding, until it permeates every atom of the physical body. 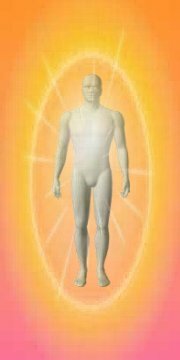 Still concentrating on that light, mentally increase its size, expanding it even further outwards until it is at least three feet or more beyond the body in every direction, until it completely encompasses the whole of the energy field, the aura. See self as being within the center of a sphere or cocoon of inner light. Then, make an affirmation that this is one's own domain. "This procedure helps keep away negative energies, creating a protected space in which one may learn to operate at the highest possible vibratory rate. The process of expanding the inner light also causes the aura to expand and strengthen. With repeated use, it can bring about a healing and strengthening of body and aura. Also, there are additional benefits; the exercise helps one to become more of who one truly is, which in turn assists one to reclaim latent gifts of one's divine inheritance. "It is also suggested that, until one becomes accustomed to meditating, this should be done at a time and place in which there is least likelihood of being interrupted by sudden noises or someone entering the room. "Also important is to be as comfortable as possible wherever and whenever one meditates; if one is not accustomed to sitting on the floor with legs crossed, this should not be considered a prerequisite. Sitting in a way that is most comfortable is recommended, preferably with the spine as straight as possible. There are reasons for this, but if sitting is not feasible, due to certain health conditions, one may also meditate lying down. "However, it is beneficial to remain flexible regarding preferred methods of meditation, so as to not become locked into just one particular method, one particular piece of music if music is used, or one set format. If one becomes too rigid in one's ways, by using only one format, there is a danger of meditation becoming master of the experience rather than the tool for the experience," the guide concluded on a very interesting note.